Hello everybody! How are you? I hope everything is well there :) Today I'd like to write a post about Fbcmd. 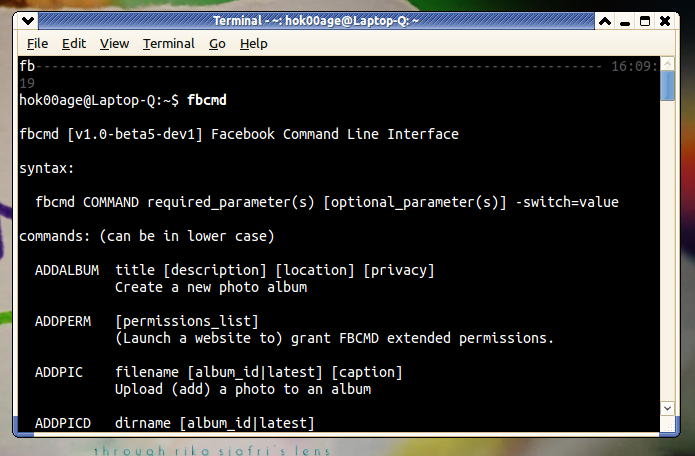 Fbcmd is a command line interface (CLI) for Facebook which is open-source and works on Windows, Linux, and Mac. Fbcmd was originally created for "fast" status update and posting some items on news feed, but it has additional features too! 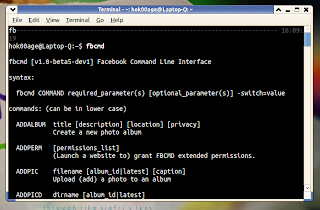 In this post, we'll cover how to get Fbcmd running on Linux system, how to configure it and finally a simple example on how to post status update on Facebook with this cool stuff. Now, please make sure that PHP is configured correctly, especially "allow_url_fopen" variable in php.ini must be set to "On". If the value of "allow_url_fopen" is still "Off" set it to "On"! It needs some times to install because it will search for update on the Internet. Once installed, please type "fbcmd" on Terminal the check wheter Fbcmd is installed correctly. The purpose of this step is to gain access to your Facebook account, so please be patient if there will a lot of commands to run. Don't worry, you should run this step only once! A web browser window will be opened again and you need to "Generate" one-time code which will be entered to Fbcmd application in order to gain "full" access to your Facebook account. Please, generate the code and remember, copy, or save the unique code. fbcmd status "This is a test status update using Fbcmd"
There are still a lot of commands of Fbcmd, you can read all of them including the examples here.